If your work involves lifting, you are likely at some risk for injury, especially to your lower back. In fact, lifting is the most common cause of low back pain at work in Canada. The number and the severity of injuries may be greatly reduced by preparing and planning for the lift, and practicing safe lifting and handling techniques. 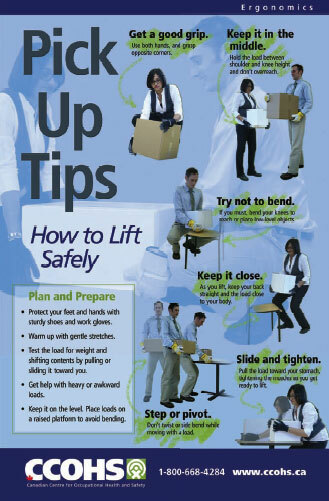 Visually remind workers about the importance of preparation and proper lifting methods by displaying this poster wherever they may be lifting objects at the workplace.